I love St. Patrick’s Day! It is a day we get to celebrate the culture of another country… and by culture I mean FOOD. Glorious corned beef, soda bread, potatoes, good beers, and whiskey… It brings a tear to me eye! Therefore I have decided that for the next couple of days I will give you some of my best Irish food recipes. The objective is to have a full Irish food spread by the end of this series, so you can impress your loved ones this weekend with your culinary know how of Irish cuisine! We will start with an Irish staple; the potato. Just like the Hispanics and Asians have the rice, the Irish have the potato. 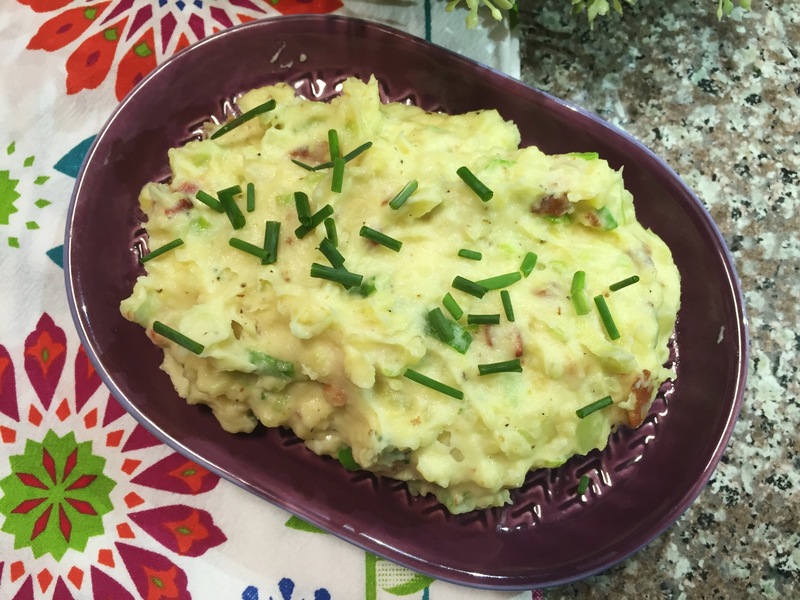 A gloriously versatile and delicious tuber that truly does not mind taking the backstage to other ingredients, or being the star of the show, and today it is the star! I could have made a simple mash, but why be boring? Mashed potatoes is something we are ALL familiar with. So for today’s recipe I went with something a little more Irish and a little more exotic for us; Colcannon. In a medium sized pot put the potatoes and cover with cold water. Stir in 1 tablespoon of salt and bring the potatoes to a boil. Once they are fork tender, drain in a colander and set aside. Rinse and dry the pot where you boiled the potatoes (to reduce cleanup later!) and return to medium-high heat. Add the bacon until you have rendered most of the fat (the bacon should look nice and crispy). Take the bacon out and get rid of half the fat you have in the pot (you can reserve it for later use), add 1 tablespoon of butter, once melted add the cabbage and saute for about 3 minutes, or until it has started to wilt. Lower your heat to low and add the potatoes, add your cream and start to mash the whole mixture. Once the potatoes are very smooth add in the remaining 3 tablespoons of butter, green onions, crispy bacon, and salt and pepper to taste. Mix everything up, making sure that all the ingredients are well incorporated. If you like a smoother consistency then add more cream or milk. Serve hot with any of the following toppings; butter, bacon, green onions, chives or parsley. Tomorrow we will go over how to make a delicious Honey Mustard Corned Beef Roast, so make sure to tune in!